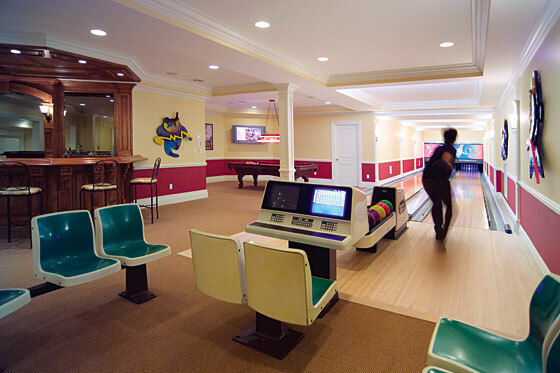 Bowling, Billiards and a Bar, Too.If you want to stretch your legs during the intermission of a movie, step outside of the theater and grab a drink at the bar, play a little pool or bowl a couple of frames. This recreation area has it all! 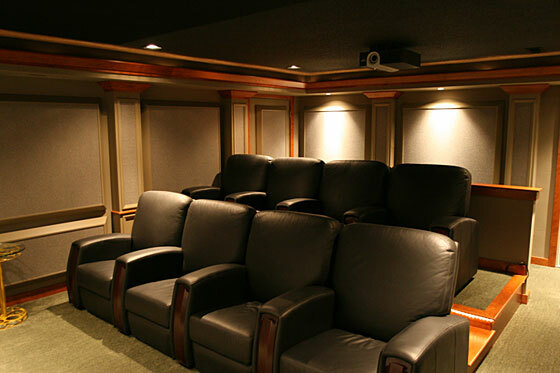 A theater doesn’t have to go in the basement, a bonus room or an unused guest room. In fact, it doesn’t even have to go in your house. 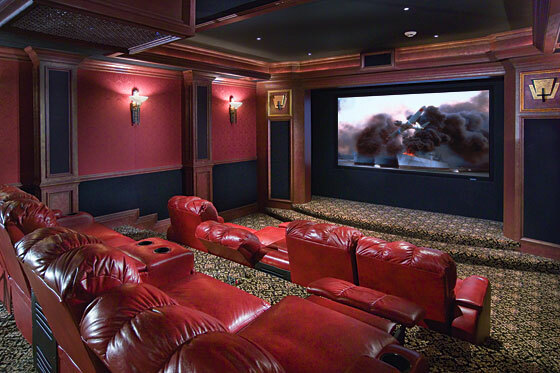 The owners of this cozy entertainment retreat proved that it can pay to look outside the box when devoting a spot to a home theater. 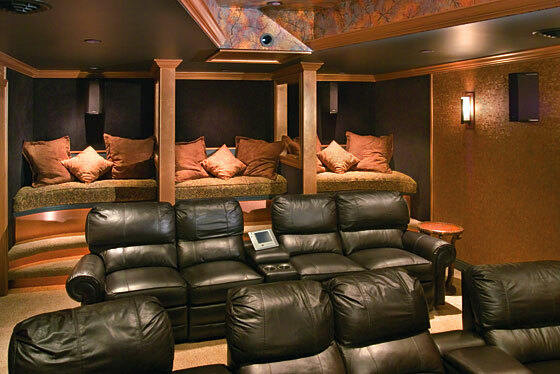 Rather than have their theater take up space inside their house, they converted a tandem three-car garage into a 160-square-foot, six-seat entertainment escape. 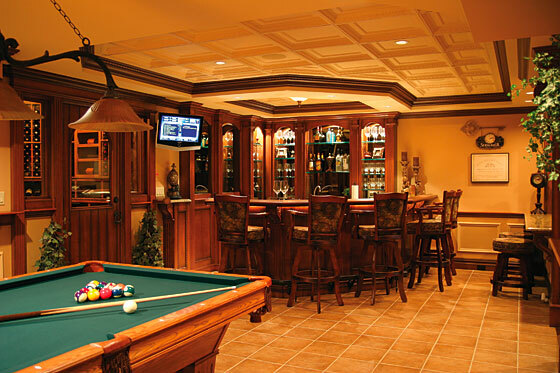 A theater, bar, gym and billiards room are a few steps away for these homeowners.How does a high-powered Wall Street couple relax? “We used to love going out for cocktail hour after work,” says the lady of the house. But that’s become nearly impossible since the couple built a home in the Jersey suburbs and she now concentrates on raising a family. The solution: Bring that cocktail hour home. 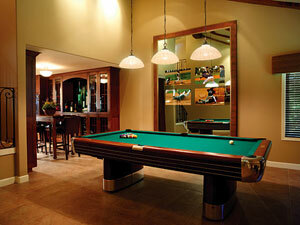 Some people derive inspiration for their theaters from hobbies and pastimes. Others create the space to remember a favorite vacation spot.The waterfall receives its signal from a iPronto remote. 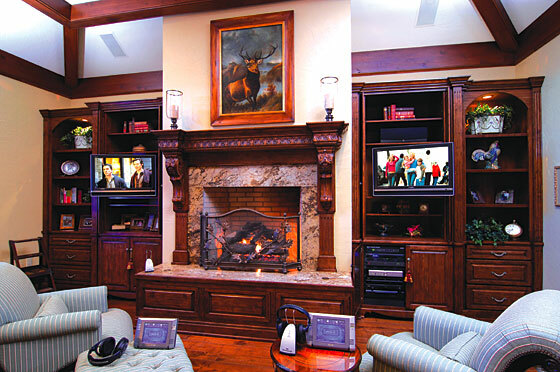 Futureview programmed the remote so that the homeowners only need to press one button to fire up the system. The WATCH button pulls up a screen that lets them select either DVD or cable. Depending on which source they choose, the iPronto signals the appropriate gear to activate. 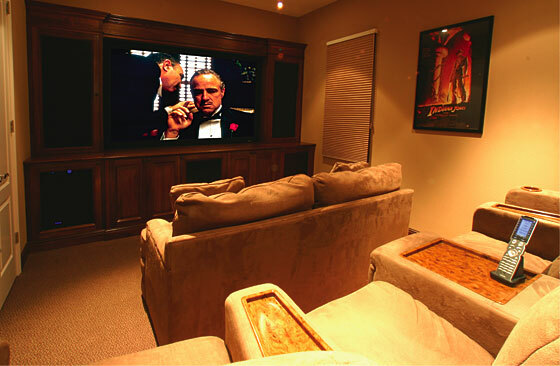 Meanwhile, the lights set themselves to the proper levels—very dim if the family will be watching a movie but a little brighter if they’ll be viewing a cable TV program. Other lighting scenes that can be engaged from the iPronto include one for entering the theater and another for post-movie clean up. 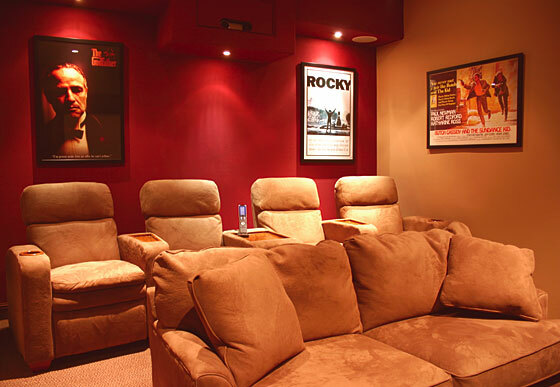 But no matter what kind of entertainment the family decides to enjoy or how they choose to set the lights, this theater will always feel well-connected with nature. How many times has this happened: You want to watch your favorite show or a great movie in the bedroom, but Honey Bunny either wants to sleep or watch something you have no interest in. 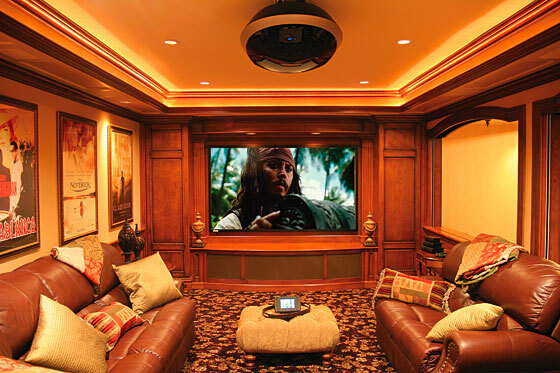 A North Carolina couple with irreconcilable viewing differences got around this marital problem with an innovative his-and-hers audio/video system. It takes a good imagination, close collaboration and strong determination to pile a mountain of electronics into a home without disrupting any of its natural beauty and tranquility. 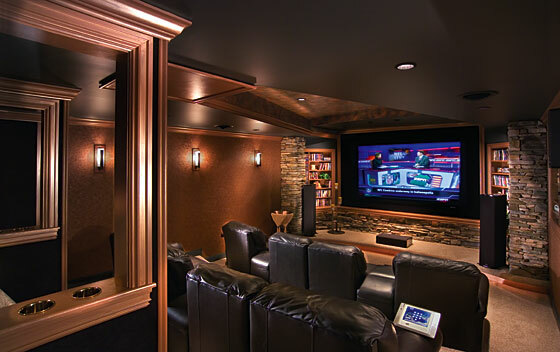 The billiards room houses four 32-inch Runco LCD displays behind a mirror—and there’s room for more.Press a button on the Crestron home system’s remote, and the door over the oven hood lifts to reveal Runco’s new VX-55d three-chip, 1080p DLP projector with a CineWide lens. A mural ascends into the ceiling, curved wooden pieces roll from behind the Stewart screen to mask it for numerous format shapes, and when the score begins, either of two sets of speakers sound off. 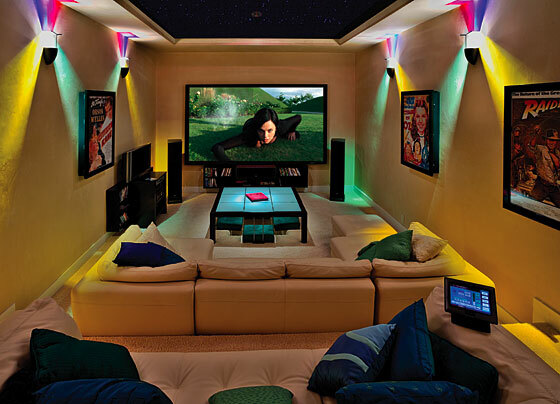 When the movie or show is over, the mural is lowered, the projector is hidden and the space reverts to a family room.